-voted cutest pet in the Vernon area! – ranked #34 in the world for Dock Dogs Speed Retrieve! – competed at the World Championships in Dubuque, Iowa! -earned her first two legs toward her CD obedience title in November! -earned her first ever agility Q in her first trial in November! at the Top Dog trial in November. -earned the final leg for his Rally Novice title on December 2nd- just under 9 months of age! – officially earned her ‘Search Dog in Training’ status by passing the fall evaluation! first-ever agility trial in July! Starters Games Dog of Canada title! – earned his first advanced Snooker Q at the Clear Sailing Trial in July! -earned his first 2 novice rally q’s at the Pawsitive Steps trial in October. -earned 2 Master Gamble q’s and an advanced snooker Q at the Top Dog trial in November. Verona- Eromit Bust A Move- earned her 2nd starters Jumpers Q to move up to advanced. title and a leg towards her senior title! -passed her Canine Good Citizen test in May! towards her Novice Standard title. – earned a CM in the Qualifying stake at the Deroche field trial in May! – earned the points for his level II and level III flyball titles in early April! – earned the points for his FD and FDX titles in NAFA!! -earned the points for his Top Flight Executive title in October! – earned her first Starters Snooker Q at her first ever agility trial in March! -earned 4 Q’s at her 2nd trial (2 Standard, 1 Gamblers, 1 Snooker)! -earned her 2nd Gamble Q at her 3rd trial! 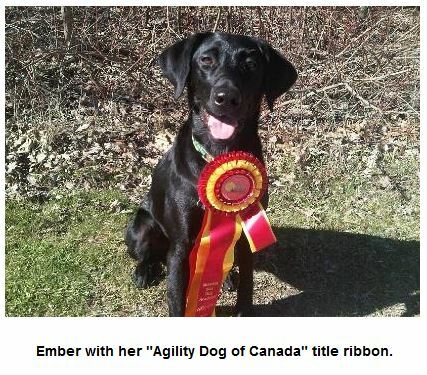 -earned the last leg needed for her Agility Dog of Canada title in early April! -earned Advanced Snooker and Advanced Gamble Q’s at Spot On in May! -Ember is on a roll and getting too many Q’s to count: follow her progress here. – last starters jumpers q earned in September to finish her SGDC title! – earned her first 2 novice Rally obedience legs at the Pawsitive Steps trial in January. – earned the last leg for her Rally Novice title in April with average scores of 189.